How would you feel if for years you had been thinking of yourself as the writer of your junior high school Alma Mater and then one day, by chance, found out you were telling yourself a lie? Memory had deceived you. You had never written the words to Woodbury, Hail to Thee! and won $10. Rather, you had written the words to For Woodbury! the pep song and won $10. This week my self-image crashed when I discovered I did not write this stanza: Woodbury hail to thee!/Your name is dear to me/ Pride of our hearts you’ll be/ All the years through./ In loss or victory/ May we all honor thee/ Fairly and honestly/ We will be true. sung to the slow and moving tune of West Point’s “How Can I Leave Thee?” Mary Jane Spencer wrote those words in 1958, though I doubt that anyone except Mary Jane and I are humming them still. “The Shaker Scroll” of May 9, 1958 does not lie. There I am on the front page, the space between my two front teeth before braces thick as a stick of Wrigley’ spearmint, the bangs cut by myself so I would look more like an 8th grader than a 7th, the striped black and white shirtwaist, the gray wool sweater with a captal “J” covering the left (padded) breast. And there is my song, full of fight, might, and loyalty, nouns decidedly absent from the story I’ve been telling myself over the past fifty years. 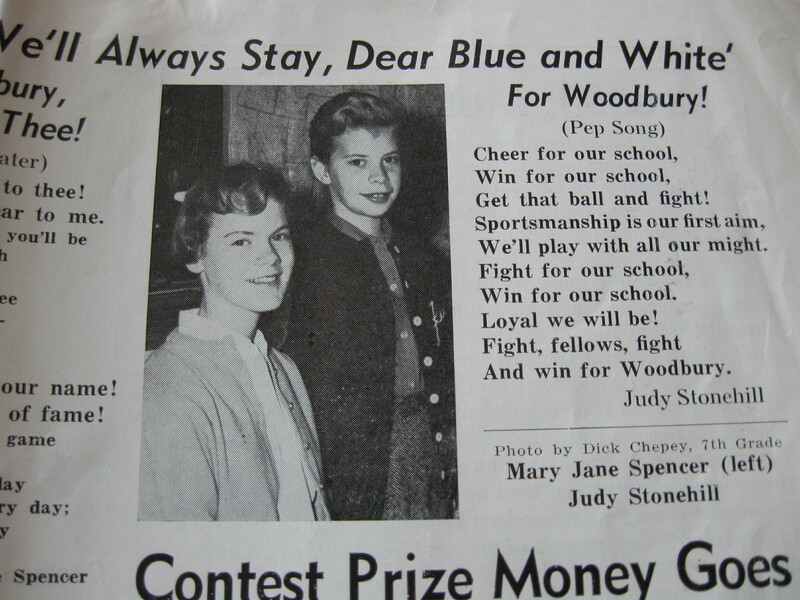 Cheer for our school/ Win for our school/ Get that ball and fight!Sportsmanship is our first aim/ We’ll play with all our might./Fight for our school/ Win for our school/ Loyal we will be!/ Fight, fellows, fight/ And win for Woodbury. Who is this hyped-up twelve-year old songwriter? Where did she go and why did she desert me? As an immigrant in Israel I seem to have imbibed the tone of the Alma Mater: Hail to thee! That is, America, Shaker, Woodbury, friends, family: I may have left, but I shall think of you always, never forget you and always be true. There is something about the last verse of the Alma Mater that also appeals to my eternally unsatisfied religious longing: In all our work and play/ Guide us through every day;/ Loyal we’ll always stay/ Dear blue and white. Were I to transcribe this verse into Israelese, it would come out as follows: Dear God, May we never forget our (glorious) past and may it’s lessons guide us through every trial, of which there will be many. 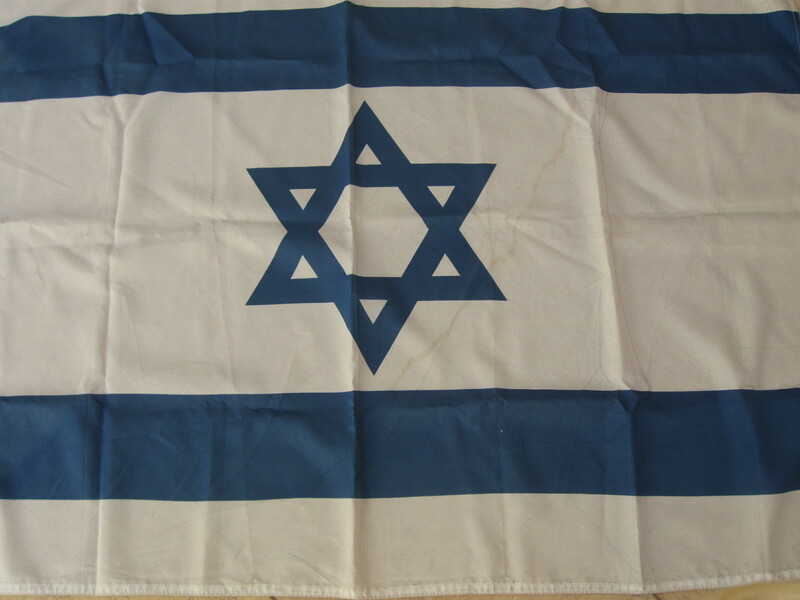 Loyal we’ll always stay to Our People Our Land and Our Torah, Our Dear Blue and White. Did my pep song desert me or did I leave it behind? I need some of that pep now. I need this spirit of Fight, fellows, fight and win, though the fellows I refer to now are not those banging heads on the football field. The fellows are traits inside me. Let’s call them fellows and gals, actually, in deference to the empowerment of women over the past fifty-three years. These traits are my strong positive active stand-up affirmative urges desires and inclinations. Over the years they have been tempered and nearly extinguished by the equally strong forces of passive lie-down negative urges desires and inclinations. The battle has been long. The cheer leaders charged heavily for their hourly sessions. Sportsmanship was often ignored. But I guess playing this (inner) game with all our might is what we are here for. Not for Woodbury and not for God; not even for the State of Israel. These are all frameworks in which the game takes place. In my attempt to incorporate the pep song into my self-image, I hereby declare that yes, we play in order to win. But we play in order to win for ourselves and those we love. And what does that winning look like? It is our ability to affirm that it is good, yes, very good, to stand up and sing. This entry was posted in Identity and tagged Alma Mater Pep Song, Judy Stonehill, Mary Jane Spencer, Shaker Scroll, Woodbury Junior High. Bookmark the permalink. If you write it, it is no dream. Writing, by itself, may not be enough, but it is the necessary first step. Let’s go sing together somewhere. You’re the tour guide! I love the post and I really love the picture! Oh my goodness, so adorable. And recognizable as you, still. Wonderful. Thanks, Joan. Your voice is important to me because I have doubts about posting this. So much is going on in the outer world and I’m visiting 1959. I guess I can rationalize it by calling it Vacation Time.